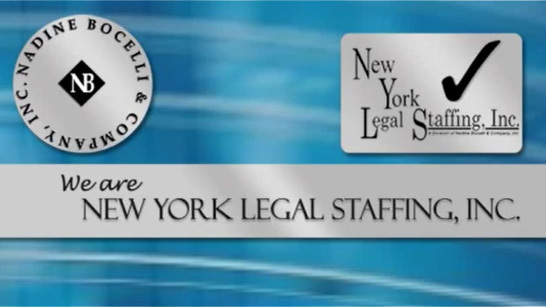 Entry Level College Graduates – Train Legal – Nadine Bocelli & Company, Inc. – New York Legal Staffing, Inc.
Several of our law firm clientele are seeking recent college graduates with administrative and secretarial skills to train in the legal profession as paralegals, legal assistants, legal secretaries, recruiting/ HR Assistants, records clerks, information technology/help desk, etc. Direct hire, temp-to-perm and/or temp legal jobs. Provide support to partners, shareholders and associates in various practice areas. Excellent organizational and prioritization skills, interpersonal and teamwork skills. Must be able to take initiative and work efficiently with higher-order thinking skills. Knowledge of general office procedures. Candidates who are motivated and adaptable will best fit these available opportunities. Excellent training programs. Proficiency in Word and a minimum typing speed of 55 wpm required for the administrative positions. Here’s a partial listing of benefits offered within these various NYC law firms. Immediate eligibility for medical and dental, prescription plan, generous vacation, health club memberships, transit plans, company cafeterias, company discounts, social functions, attendance awards, annual reviews, 401(k) plans, life insurance, short term and long term disability plans, flexible spending accounts, and much more! #1 Legal Careers Within Law Firms … Entry-Level Legal Jobs in New York City & Tri-State Area!